Lost that all important advertising campaign to the opposition? Swinging conker balls are a entertaining and wasteful way to watch advertising in action. Swing and collied with the juxtaposed logo'd conkers. 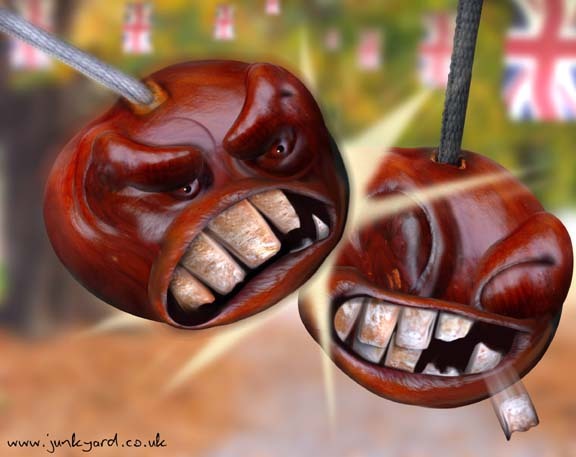 With hilarity and promptitude the conkers smash into each other obliterating their competition. Small Volvo imprinted water balloons are always an option. I think you need to explain conkers for us americans. I read a novel that had the game in it once and I was completely lost because of it. Ah po, I have a secret reciepe for stiffening outer casing if interested? Involves vinegar.